Click on this link for an expanded & up-to-date version of this table. Also including group averages for other continental scores (West Asia, Asia & Pacific, Europe). The “Senegal” region is sharply decreasing while the “Mali” region is skyrocketing. A fall of about 20%-30% on average for “Senegal”, even for confirmed Senegalese. An increase of about 35-45% on average for the “Mali” region. Implying that this region is not only replacing much of the former “Senegal” scores. But in fact also many of the other regional scores which were either showing up as secondary regions or minor trace regions. Due to being neighbouring regions it was to be expected that “Senegal” and “Mali” would show considerable overlap. Still this outcome mostly contradicts known background and historical plausibility for the people involved, aside from the Malian sample. Plus it means a step backwards when compared with the previous situation whereby “Senegal” seemed to function as a reasonable proxy for describing origins from coastal Upper Guinea (often but not per se Atlantic speakers). While “Mali” was acting more as a proxy for origins from more inland parts of Upper Guinea (often central Mande speakers but also covering Gur speakers). Minor “North African” scores (<5%) are no longer being reported after the update. While the considerable level of around 14% “North Africa” among my Fula samples is being halved! For Cape Verdeans this outcome is probably mostly linked to the new “Portugal” region which now includes these older ancestral affiliations with North Africa. 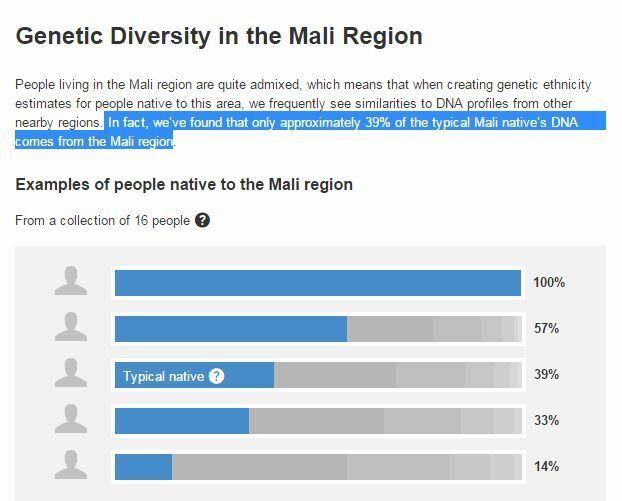 However also the newly updated “Mali” region might draw in such North African genetic markers. Continued discussion in part 2 of this blog series. “Ivory Coast/Ghana” and even more so “Nigeria” amounts are in steep decline, while “Benin/Togo” is widely expanding. “Nigeria” amounts are being evaporated with 30-40% on average for Nigerians across the country! Not only affecting Yoruba’s and Igbo’s from southern Nigeria. In fact also Hausa-Fulani from northern Nigeria are now receiving less than half “Nigeria” as before. “Benin/Togo” is especially on the increase for southern Nigerians, around 30% on average. Not only for Yorubas but also Igbo’s. But actually “Benin/Togo” is also expanding greatly into Ivory Coast and even Liberia. Despite these countries not being neighboring ones! Even Hausa-Fulani are now receiving minor “Benin/Togo scores. When previously it was usually absent for them and could be used as a proxy marker between southern & northern Nigerians. Not much change in the average “Benin/Togo” amount for my Ewe samples from Ghana. 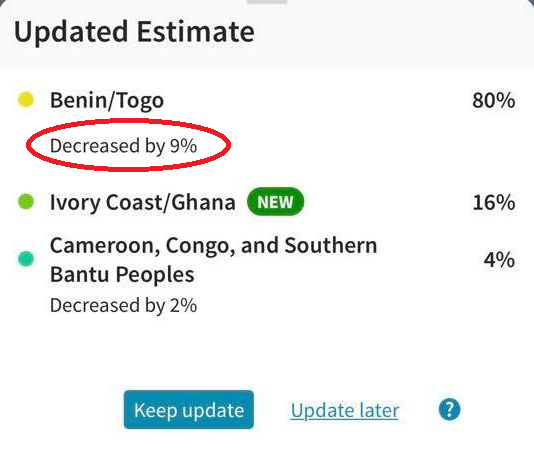 However for one person who used to have 97% “Benin/Togo” it actually diminished by about 30%! Also peculiar how the “Ivory Coast/Ghana” group average is showing an increase of about 10%. Even when for practically all other West Africans this region has been on the decrease. Likewise for two actual Beninese samples with Gbe background (Ayizo & Goun) the “Benin/Togo” amounts did not change much. Although interestingly for one of them it decreased by 9%. The “Ivory Coast/Ghana” amounts making the biggest increase (10% on average). The sample-size might be small but it is perhaps telling that no 100% “Benin/Togo” scores were achieved. The new “Cameroon, Congo, and Southern Bantu Peoples” region is advancing strongly into Nigeria. 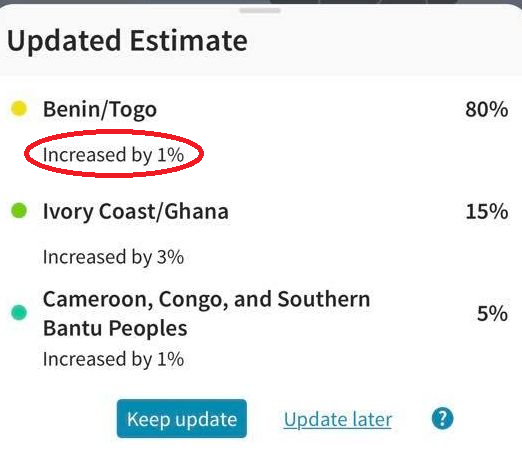 In particular for Igbo’s it shows an increase of about 25% when compared with the former “Cameroon/Congo” and “Southeastern Bantu” regional scores combined. 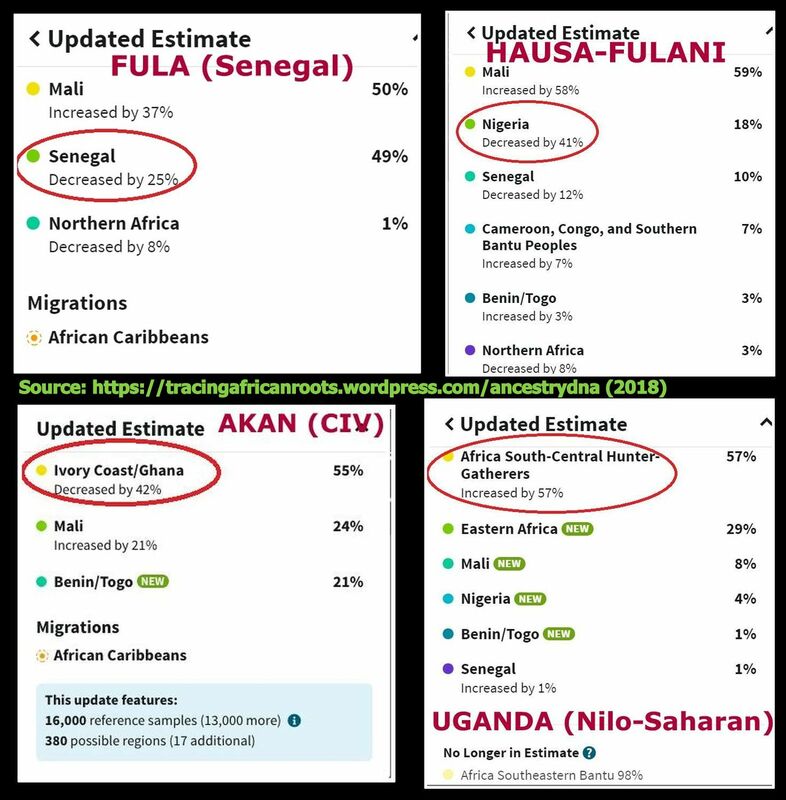 But actually also Yoruba’s and Hausa-Fulani are receiving more of this genetic cluster than previously (5% on average). 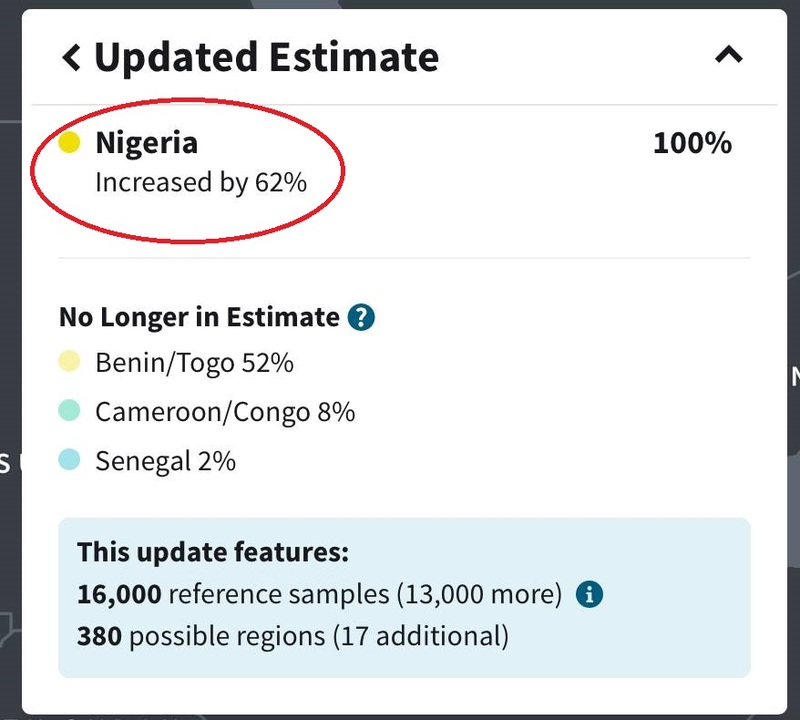 It seems apparent that AncestryDNA’s update has not produced any meaningful improvement in describing the regional origins of people in this part of West Africa. On the contrary it has created a greatly muddled framework. Especially since “Mali” and “Cameroon, Congo, and Southern Bantu Peoples” are now also appearing in substantial amounts. Even when both of these regions are technically speaking from outside of the Lower Guinea area. The newly combined “Cameroon, Congo, and Southern Bantu Peoples” region seems to be very accurate for Central Africans but not totally comprehensive for Southern Africans. For my samples from Cameroon, Equatorial Guinea, both Congo’s as well as Angola (Bakongo) a near perfect 100% score is being reported even! Which is exactly in line with their recent origins obviously. And therefore certainly to be counted as an improvement. Most Southern Africans (except for South Africans) were formerly described by AncestryDNA as a combination of both “Southeastern Bantu” and “Cameroon/Congo”. Which could be somewhat confusing but given awareness of the wider context (relatively recent migrations originating in southern Congo in the 1400’s-1600’s; genetic deviation from South African samples in Ancestry’s Reference Panel) still largely made sense. A relatively elevated level of either “Cameroon/Congo” or “Southeast Bantu” (when comparing with test results across the area) served to indicate distinctive ethnic origins at times even (such as Ngoni lineage in Malawi who are relatively recent migrants from South Africa or western Tanzanian Bantu people). This potentially insightful distinction has now been lost and instead minor but still considerable “Eastern African” scores are showing up consistently for all Southern Africans in my survey. Peaking among my 3 Malagasy samples but also quite elevated in Malawi and Zimbabwe. And even showing up for my Bantu speaking South African samples (Swazi, Xhosa, Zulu). As shall be explained in part 2 of this blog post these so-called “Eastern African” scores can actually also be made less puzzling when knowing which exact East African samples are being used by AncestryDNA. Still intuitively (just going by the regional labeling) this outcome is probably poised to generate greater confusion than previously. The “Hunter-Gatherer” regional scores may have practically disappeared for Central Africans. But for South Africans, in particular South African Coloureds, they are still very pronounced. To a larger degree than previously even. Given the widely known and relatively recent ancestral connections with the Khoi-San people this comes as no surprise. However it remains to be seen if these updated scores do indeed correspond better to their actual genetic legacy. 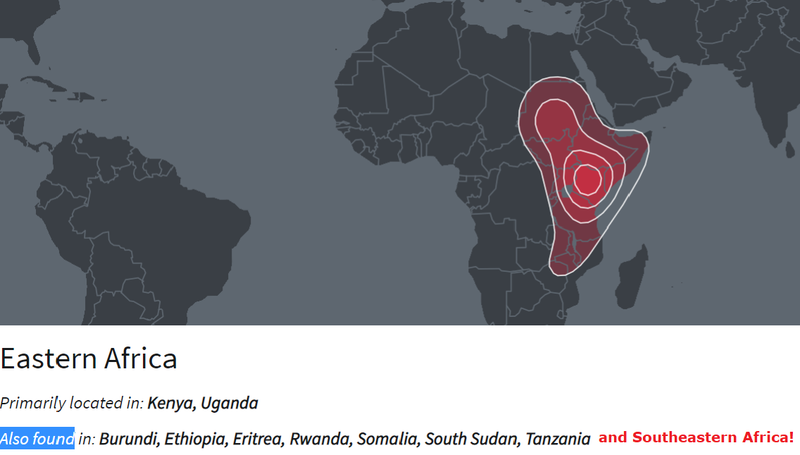 “Eastern Africa” is the only truly new African region within AncestryDNA’s update. In itself this makes for a very useful addition. However the prediction accuracy of “Eastern Africa” is rather disappointing. Only reaching levels of 45-55% on average for my Kenyan, Tanzanian, Ugandan and Tutsi samples. However for the few results I have seen from Somalia, Sudan and South Sudan it is even less predictive. Even when misleadingly labeled the former “Southeastern Bantu” region did seem better equipped to single out Nilotic-(like) DNA markers for Northeast Africans. With this update instead also the “Hunter-Gatherer” region is needed as an additional proxy. Out of the blue! Quite astonishingly reaching levels of nearly 60% even for one Ugandan but also appearing very pronounced for my South Sudanese, Somali and Tutsi samples. It is more variable among Tanzanians and Kenyans, most likely correlating with actual ethnic background. This outcome comes across as quite random and outlandish but is possibly to be explained by the addition of new Hunter-Gatherer samples in AncestryDNA’s Reference Panel. Presumably from Tanzania, continued discussion in part 2 of this blog series. The newly combined “Cameroon, Congo, and Southern Bantu Peoples” region is another major component in the results of Kenyans, Tanzanians and Ugandans. On average in between 20-50% for my survey participants. Individual scores will most likely be correlating with ethnic background. Although perhaps less apparent than in the former upset when “Cameroon/Congo” could be used for example to indicate eastern Congolese ancestry for Swahili Kenyans. Still it is tellingly absent for my Somali sample and quite subdued for my Tutsi samples. Minor “North African” scores are on the decrease for Kenyans and Somali. However for actual Maghrebi the “North Africa” region appears to have become more predictive. More so for my 3 Moroccan samples (79%) than for the Algerian ones (44%). However my minimal group averages are somewhat skewed. 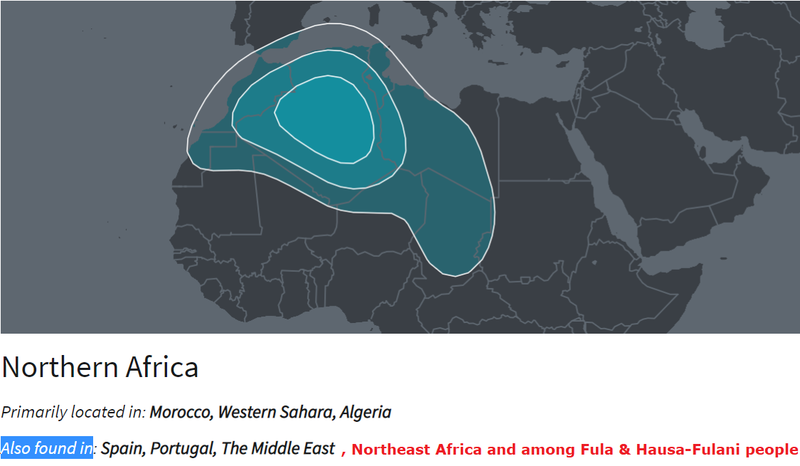 As it is quite likely that 1 Moroccan person who scored 100% “Northern Africa” after the update has been included as an customer sample into AncestryDNA’s Reference Panel. Causing an overfitting or calculator effect which arguably also occurred on 23andme in the past. Actually this also seems to have happened with two of my Nigerian samples (Yoruba & Igbo). Aside from that one perhaps atypical 100% result my other North African survey participants still show greatly blended compositions. Also including West Asian and South European scores. Even if to a lower degree when compared to before the update. Such breakdowns (mostly reflecting ancient geneflow/similarity) can still be misleading therefore, when taken too literally. Especially given the appearance of the new seemingly specific “Portugal” region. A regrettable loss of distinction seems to be occurring for the usually minor but still clearly detectable West African admixture being reported for Moroccans and Algerians. Before the update this ancestral portion was consistently being described in either “Senegal” or “Mali” regional terms. However after the update it seems to have been incorporated mostly within the new “Northern Africa” region only leaving room for a very minimal scattering of various West African regions. Historically speaking a mostly Upper Guinean component reflecting West African admixture among Maghrebi’s is much more plausible and therefore more informative. 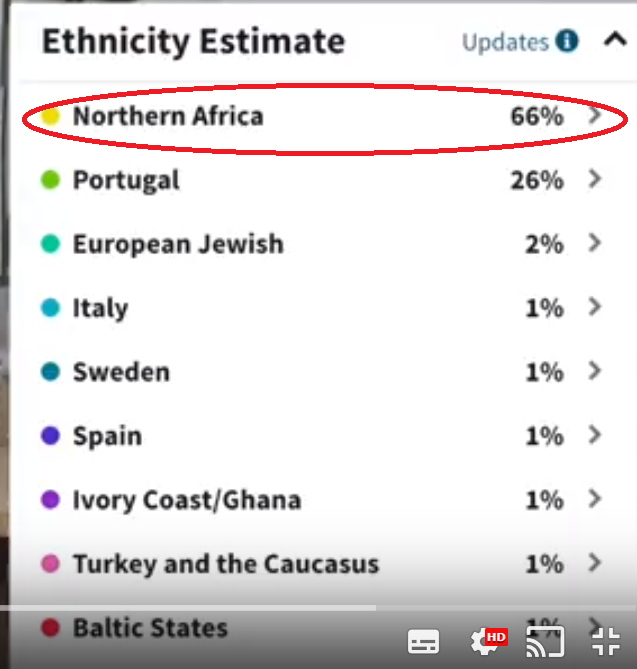 Ancestry fortunately continues to provide useful background information and careful disclaimers on how to interpret their “Ethnicity Estimates” and the various regions which are shown in it. Customers should really invest more time in informing themselves properly about this AncestryDNA update. In order to avoid being left confused or mislead by their new results. A good start is: pay close attention to the regional maps integrated within your Ethnicity Estimate! In the past I have attempted to extract general lessons to be learnt from the AncestryDNA results being reported for Africans. Wishing to improve correct interpretation of AncestryDNA’s African breakdown for Afro-Diasporans as well as Africans themselves. Sadly I do not think such an effort will be very fruitful any more. At least not based on the data currently available to me. Given the general decline of informational value as well as the great degree of incoherency for many of the results I discussed above. It is to be feared that the randomness factor will be even greater for Afro-Diasporans who will usually have a much more complex background than Africans themselves. Multiple ancestral scenarios might be valid now more than ever. None to be ruled out in advance. Decreasing the odds of any clearcut interpretation based on deductive logic. I will keep it brief therefore. As always this overview firstmost reflects my own reasoning and naturally other interpretations remain possible as well. You will need to perform your own follow-up research (relevant historical context, DNA matches, genealogy etc.) in order to find out more specifics. Although again, personally I think such an attempt will often be futile and not worth the effort. In many cases it might be best to stick with your previous results…Continued discussion in part 3 of this blogseries. Source: Ancestry. Text in red added by myself based on my survey findings and informed speculation. Ironically the geographical spread shown in this map corresponds very well with my survey findings before the update. But less so afterwards. Follow this link for the pre-update version of this map. 2) “Mali” scores are likely to be inflated. Not only replacing former “Senegal” scores but also often over-extending into other West African countries (not per se neighbouring ones even!). Source: Ancestry. Text in red added by myself based on my survey findings. Take note of the vast territory covered now by this region. Which probably still is an underestimation of its true extent into also Ghana and Nigeria. Follow this link for the pre-update version of this map. 3) “Ivory Coast/Ghana” has become less predictive of actual Ivorian/Ghanaian Akan lineage as well as less predictive of Liberian and Sierra Leonean origins. Source: Ancestry. Text in red added by myself based on informed speculation. Ironically the geographical spread shown in this map corresponds very well with my survey findings before the update. But less so afterwards. Follow this link for the pre-update version of this map. 4) “Benin/Togo” scores are likely to be inflated. Not only replacing former “Nigeria” and “Ivory Coast/Ghana” scores but also often over-extending into other West African countries (not per se neighbouring ones even!). Source: Ancestry. Text in red added by myself based on my survey findings. Astounding coverage of nearly all West Africa and even including Gabon! It begs the question why AncestryDNA still bothers with a seemingly exact country name labeling. As it only sets up for major confusion… Follow this link for the pre-update version of this map. 5) “Nigeria” has become less predictive of actual Nigerian DNA. 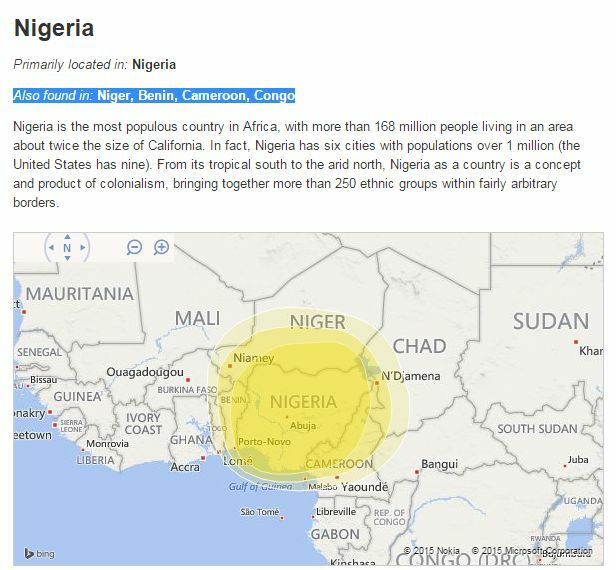 Both southern and northern Nigerian ancestry is now very poorly covered by “Nigeria”. Any remaining “Nigeria” will not per se be linkable to any given ethnic group or subregion within Nigeria. Source: Ancestry. Text in red added by myself based on informed speculation. As previously “Nigeria” amounts were also reported for people from South Sudan. Possibly indicating some Chadic-Nilo-Saharan connections. However, a northern shift of the “Nigeria” region has not been confirmed by my survey findings. Follow this link for the pre-update version of this map. 6) “Cameroon, Congo, and Southern Bantu Peoples” scores are likely to be inflated. Replacing former “Nigeria” scores in particular. Very lamentable that AncestryDNA has only aggravated the already existing issue of overlap between Bight of Biafra and Central African origins! Also the removal of the former “Southeastern Bantu” region is a step backwards in achieving finer regional resolution for Afro-Diasporans. Source: Ancestry. The regional span of the combined “Cameroon/Congo” and Southeastern Bantu” regions covers an enormous area, including more than 20 countries and not just Cameroon & Congo! But also for example Angola, Mozambique, Madagascar and Nigeria! 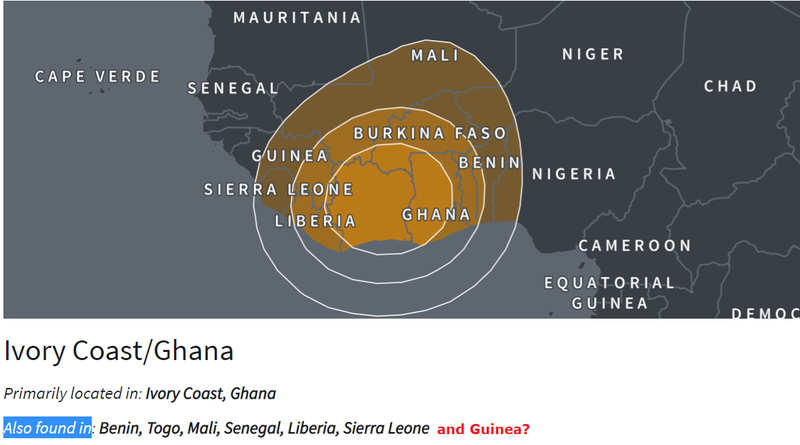 Together with “Benin/Togo” epitomizing the loss of focus in AncestryDNA’s updated African breakdown. Follow this link for the pre-update version of this map. 7) “Eastern Africa” is not a perfect measure of Northeast African DNA. It is also predictive of Southeast African ancestors. This latter ancestral scenario will usually be much more relevant for Trans-Atlantic Afro-Diasporans due to historical plausibility. Source: Ancestry. Text in red added by myself based on my survey findings. This new region is to be found as far south as South Africa and also in countries such as Madagascar, Malawi, Zimbabwe and Zambia. 8) “South-Central Hunter-Gathers” has become less predictive of actual Pygmy DNA. And is now also to be found in Northeast Africa! Source: Ancestry. 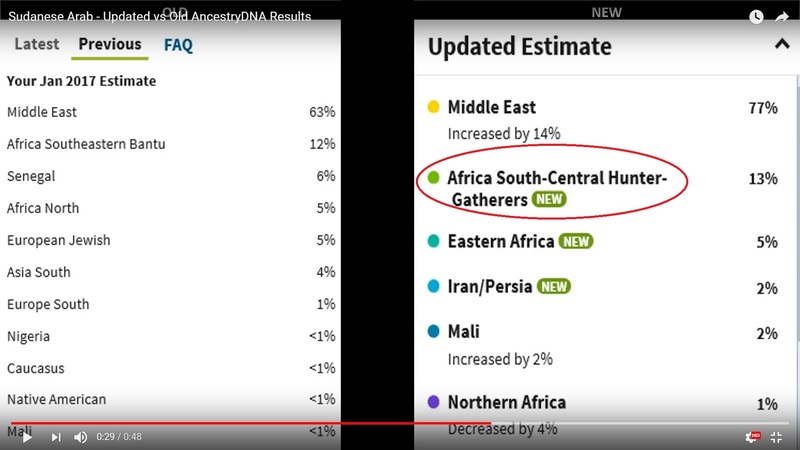 Although not mentioned in the regional description text it seems very apparent that new Hunter-Gatherer samples have been added within AncestryDNA’s Reference Panel. Most likely from Tanzania (either Hadza or Sandawe). The map does clearly show this unexpected (and unhelpful) expansion into Northeast Africa. Follow this link for the pre-update version of this map. 9) “Northern Africa” has become less predictive of more ancient affiliations with North Africa. Source: Ancestry. Text in red added by myself based on my survey findings. Before the update “Africa North” scores were more pronounced among Cape Verdeans, Northeast Africans and Fula & Hausa-Fulani people. Most likely either absorbed in the new “Portugal” and “Eastern Africa” regions or also partially in the “Mali” region due to the addition of new samples. This table is based on my survey findings for 5 Cape Verdean AncestryDNA results. The African breakdown being scaled to 100% and corrected for North African scores. This is however not necessary if you want to compare your own before & after results using this macro regional framework. Simply use your original and updated African amounts and contrast your former “Cameroon/Congo” and “Southeastern Bantu” scores with the newly combined “Cameroon, Congo, and Southern Bantu Peoples” regional score. Also add in any “Eastern African” or “North African” score whenever present. 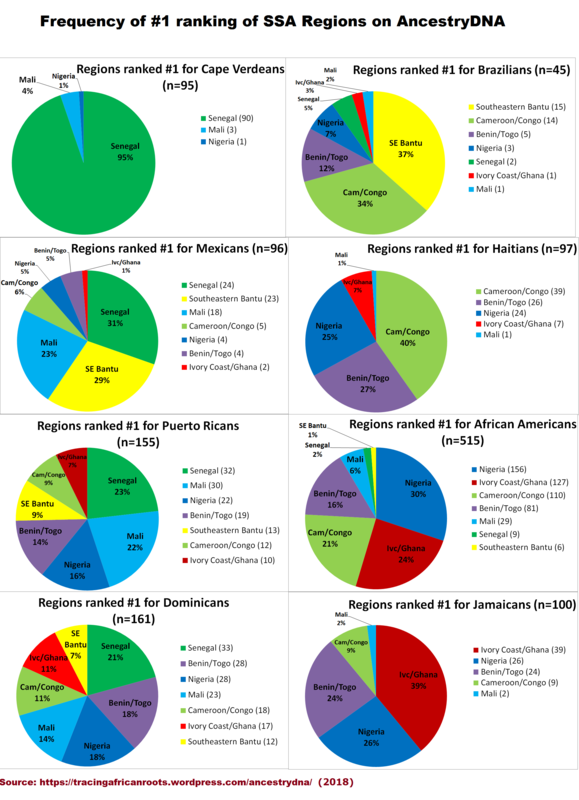 Combining various levels of regional resolution: on the left the 4 main regions of provenance for Afro-Diasporans (based on slave trade records, see also this link). African ethno-linguistic groups according to the most recent classification are depicted in the middle (see also this link). The map on the right features the current 9 African AncestryDNA regions (source: Ancestry). To make more sense of my Afro-Diasporan survey findings I have been using an additional more basic macro-regional framework divided into: Upper Guinea, Lower Guinea and Central & Southeast Africa (see this table for my latest findings). Basically combining interrelated & neighbouring AncestryDNA regions on a macro-level. Such a grouping also being based on historical and ethno-linguistical considerations, aside from genetic ones (see maps directly above). This research approach may still have some added value when trying to determine how any newly updated African breakdown compares with the previous one. Because it allows certain regional patterns to show up more clearly. Drastic proportional changes between macro-regions perhaps being less likely than any relative shifting between neighbouring regions within either Upper- or Lower Guinea or Central & Southeast Africa. Although possibly still useful in individual cases I am doubtful this framework can be used in a meaningful way on a group-level when wanting to contrast with historical slave trade data. Given the far greater degree of regional overlap the distinction between Upper & Lower Guinea and between Lower Guinea and Central/Southeast Africa has become much more blurry than before. 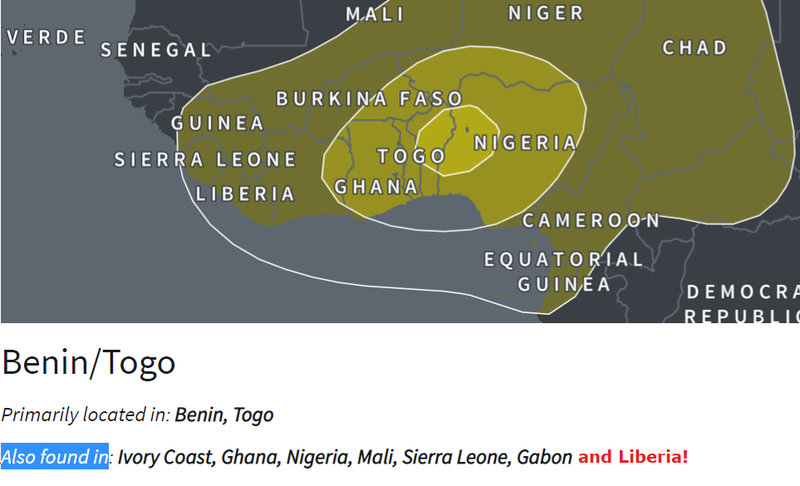 According to Ancestry’s own information “Benin/Togo” is now to be found as far south as Gabon (!) which technically speaking would be Central Africa. On the other hand the new “Cameroon, Congo, and Southern Bantu Peoples” region is also advancing across Nigeria. And probably also reported in subdued amounts for Beninese themselves. It already used to be quite difficult to separate Bight of Biafra (to be included in Lower Guinea) from Central African ancestral connections. But making the distinction has now become nearly impossible! While “Mali” is now showing up with substantial scores for people native to not only Liberia but also across southern parts of Ghana and the Ivory Coast and even into Nigeria! Undoing its signalling function for primarily Upper Guinean lineage. During my AncestryDNA survey I also kept score of the frequency of top ranking regions within the African breakdown (see this chart for my latest findings). Again I think such an exercise, which used to be quite insightful, will no longer be meaningful when wanting to contrast with historical slave trade data. Just going by the many updated results I have seen already (mainly for African Americans and Hispanics) I highly suspect that “Benin/Togo” as well as “Cameroon, Congo, and Southern Bantu Peoples” will overwhelmingly and often misleadingly be reported as primary region henceforth. For many parts of the Afro-Diaspora, incl. also West Indians and not just Haitians and Brazilians for whom a top ranking frequency of both regions is indeed historically plausible (on a group level, so leaving aside individual variation). Without wanting to come across as pretentious (I do realize I am a mere layman researcher 😉 ) I think it is already apparent that the updated African breakdown on AncestryDNA provides a worse basis for research purposes than the previous one. 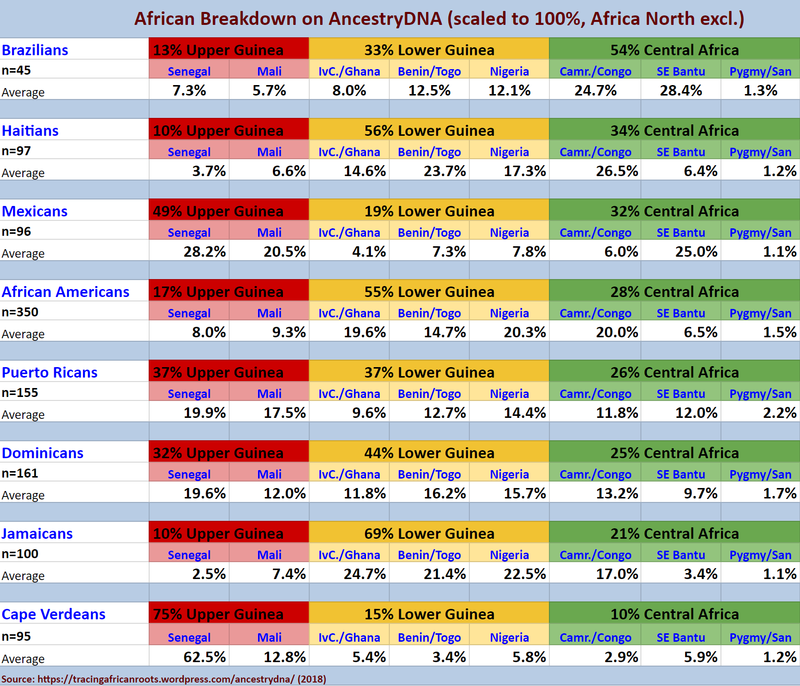 Obviously AncestryDNA’s African breakdown which was provided between 2013-2018 also had its shortcomings. But still it represented a major advance at that time and offered unrivaled West African regional specificity when compared with other commercial DNA testing companies during that same time period as well as any third-party analysis such as available on Ged-Match, DNA Land etc.. 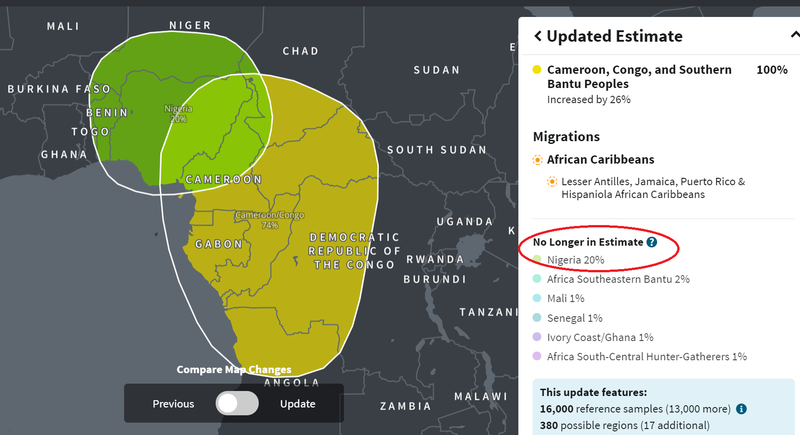 Personally I consider it to be a true loss that Ancestry’s pioneering analysis of especially West African DNA seems to be going down the drain with this update… In some ways I even find that the prevailing and over-extended regional trio of “Mali”, “Benin/Togo” and “Cameroon, Congo, and Southern Bantu Peoples” is reminiscent of the simplistic three-way model (based on Mandenka, Yoruba and Bantu samples) used in DNA studies from 2009/2010! Almost making it seem like Ancestry turned back the clock on its African breakdown with practically ten years! I will only be posting a limited selection of screenshots. But this array does cover all main parts of Africa. Obviously there might be greater individual variation within each country or even within a particular ethnic group. Still this should already be quite illustrative of the main patterns I have described above. As far as I was able to verify all of the following screenshots below are from persons with four grandparents from said nationality/ethnicity, unless specified otherwise. But naturally I did not have absolute certainty in all cases. Practically all results have been shared with me by the DNA testers themselves. I like to thank all my survey participants for having tested on AncestryDNA and sharing their results online so that it may benefit other people as well! Quite atypical result as the “Nigeria” score is (spectacularly) increasing rather than decreasing. It is quite likely however that this person has been included as an customer sample into AncestryDNA’s Reference Panel. Causing an overfitting or calculator effect which arguably also occurred on 23andme in the past. Quite atypical result as the “Nigeria” score is increasing (it used to be 88% which is already very high) rather than decreasing. It is quite likely however that this person has been included as an customer sample into AncestryDNA’s Reference Panel. Causing an overfitting or calculator effect which arguably also occurred on 23andme in the past. I do not have any other Igbo screenshots available at the moment. However see also my spreadsheet for more updated Igbo results. 1) It might be a different story for the European and Asian breakdowns. I have actually seen quite encouraging updated results in this regard. And generally speaking they could be an improvement indeed. Although there are also still some remaining issues. The non-African regional breakdowns are however not a topic of discussion in this blog post. 2) In order to investigate the predictive accuracy of AncestryDNA’s African breakdown I have been calculating provisional benchmarks (group averages, see this overview) based on African customer results. But I have also looked into historical plausibility in regards to the documented African roots of the Afro-Diaspora. Based mostly on slave trade patterns and historical references to specific African ethnic origins for the Afro-Diaspora (see this overview). 3) Practically all African AncestryDNA results have been shared with me by the DNA testers themselves. Although a few times I also obtained them by way of social media. Naturally I verified the background of each sample to the best of my capabilities but I did not have absolute certainty in all cases. I like to thank all my African survey participants for having tested on AncestryDNA and sharing their results with me so that it may benefit other people as well! On the other hand ancestral categories referring to ethnic groups might be just as deceptive or even more so. As many people will again tend to take them too literally. Underestimating not only the sheer number of ethnic groups existing in Africa (thousands!) but also the complexity of interplay between fluid ethnicity, overlapping genetics and shifting political borders. An intermediate solution might be ancestral regions which are referring to either non-political geography or ethno-linguistic groupings. But I fear there will always be some degree of blurriness involved and exact delineation might be impossible to achieve in many cases. Also from Ancestry’s FAQ section it can be learnt how their regional maps are to be interpreted. They are again not to be taken too literally as Ancestry obviously does not possess perfect information about the genetic background of all Africans! And this should also not be expected from them. But these maps can still be very useful to give you an approximate idea of how widely extended each region might be. As long as you keep in mind these maps are made on a best-effort basis. From my previous survey findings I found that Ancestry tended to underestimate how widespread some of their regions could be. For example “Ivory Coast/Ghana” extending into Liberia and Sierra Leone. They have mostly corrected this in their present update however there may still be some omissions. 5) There is actually solid evidence pointing towards genuine Malian lineage for Cape Verdeans (see section 3 of this blog page). However to a much lesser degree than these updated AncestryDNA results are suggesting. Certainly not predominating other types of Upper Guinean lineage, hailing from Senegambia, Guiné Bissau, Guinea Conakry and Sierra Leone! I am quite certain that these inflated “Mali” scores are mostly an artefact of Ancestry’s new algorithm as well as their new selection of reference samples (it now has 169 samples from Mali versus only 31 from Senegal and ZERO from Guiné Bissau, see this link). Hence why Cape Verdean’s African DNA now gravitates towards “Mali” rather than to “Senegal”. I find that the new “Senegambian & Guinean” category on 23andme has a far more fitting proxy labeling for Cape Verde’s Upper Guinean lineage than either “Mali” or “Senegal”. This entry was posted in DNA Testing and tagged AncestryDNA. Bookmark the permalink. Wonderful post (as usual). Thanks for the informative and thoughtful review. This is a darn shame…i feel like this update pretty much made everyone who is AA a clone. No unique results, which really makes it seem all the more less accurate. We’re all seemingly from benin togo and mali. seeing people in the survey who are full blooded Nigerian, have nigeria completely REMOVED all together just makes me really side eye ancestry very hard, and deem them hardly trust worthy at all now. It seems really lazy how they lumped so many countries under one name…. I mean wtf does Gabon have to do with benin/togo? they aren’t even in the same region. I was low key hoping they would correct that overblowned benin togo score of mine, cause i just felt it wasn’t very accurate from the beginning…idk. Now i come back to find it even higher, with countries that have nothing to do with it. i mean The actual 2 countries are TINY..so why is it blown up all over the place as the default title?. I think my entire african percentage went up and most of it ran into benin togo and cameroon congo/ southern bantu. With along with everyone else Mali sky rocketing…Everyones results are to similar..this has to be highly flawed. An omg am i seeing this right? someone from south sudan who had 1% mali scores shot up to 18%???! that’s no where close …..sigh the more i see this, the absurd this becomes. 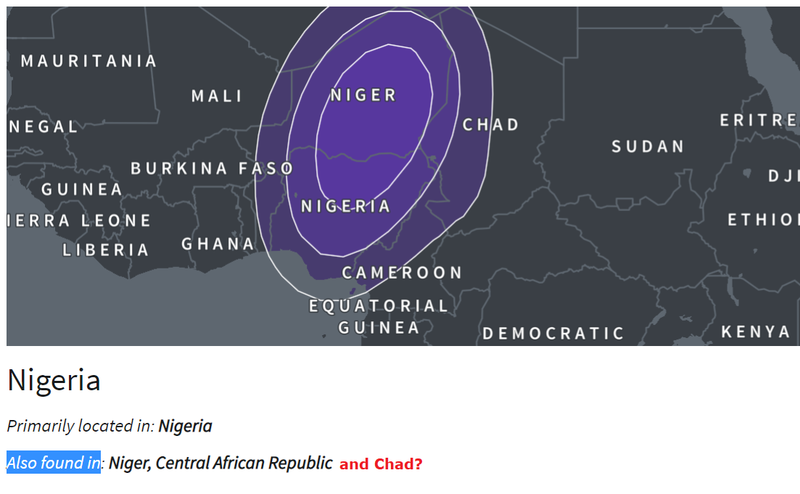 At this point im just gonna stick with 23andme trash african results. At least they aren’t trying to over simplify with country names and giving new results that are so drastically different, that you question what to believe at all on the page. “If he’s pure S.Sudanese, I wonder if he might have Azande ancestry — they’re the only S.Sudanese Bantu tribe I’m aware of. Perhaps that might explain the Cameroon Congo & Ivory Coast affinity. 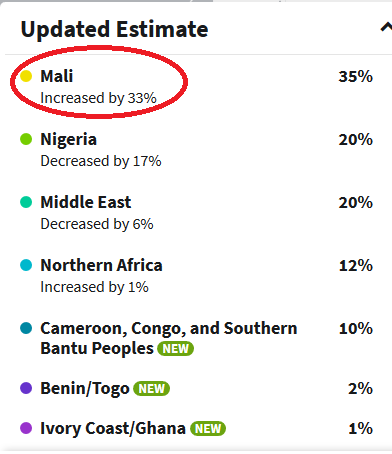 Funny enough before the update my Mali score was 12%, and now it’s 3%;even my Senegal dropped by 2% and now I’m at 1%. Also, the region for Mali is no longer based in southern Mali but now includes the entire country. Specifically pointing to east central Mali. 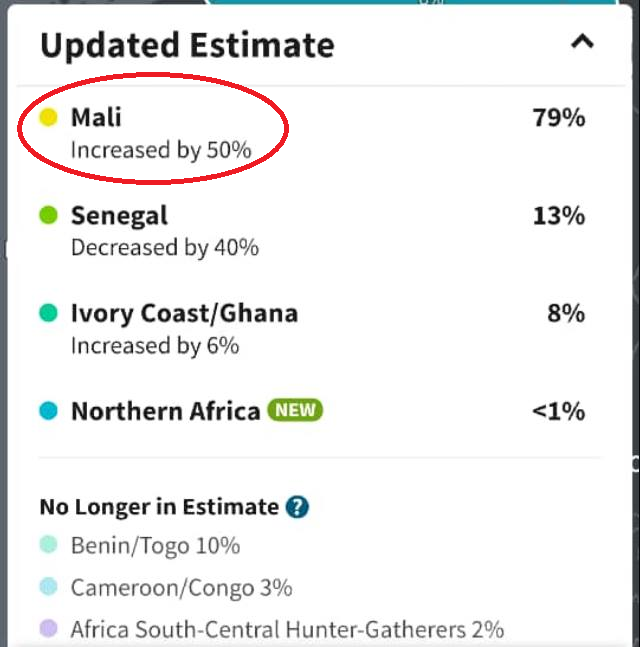 Everyone’s Mali score increased but mine decreased. 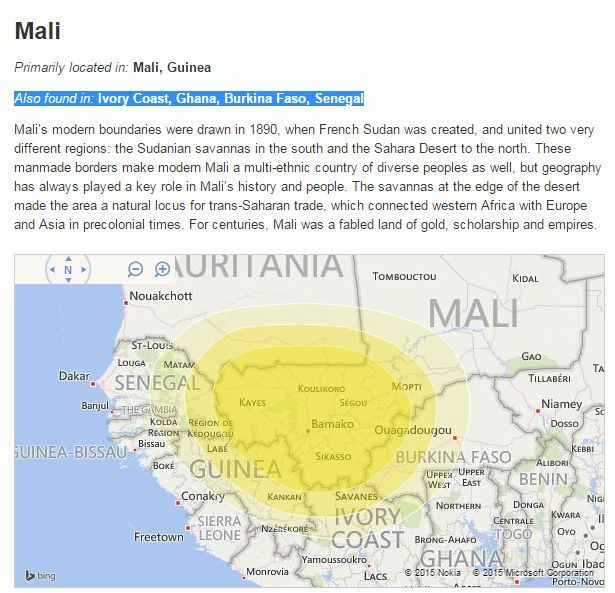 @Joshua, Ancestry has added many new samples for the “Mali” region, there used to be only 16, but right now it’s 169! Most likely of various background within Mali. More details in part 2 of this blogseries. And don’t forget the biggest one of them all: “Cameroon, Congo and Southern Bantu people”, haha. One of the main aspects of my Afro-Diasporan survey was to look into the frequency of top-ranking African regions. In other words how many times a particular African region would be mentioned as having the biggest amount in the African breakdown. I figured that on a group level with sufficient sample size you could already start looking at how much it would correlate with whatever has been historically documented (mainly slave trade records) about the regional African origins of various parts of the Afro-Diaspora. In my latest summary of my findings I did indeed find that this correlation was quite reasonable. Not perfect of course but still the arising patterns seemed to make sense and were also helpful for getting more insight into how various parts of the Afro-Diaspora relate to each other: which African regions they have in common and which regions happen to be either more pronounced or subdued, on average. I will not restart my survey among African Americans as I do not think it will have added value. However just going by the dozens of updated AA results I have already seen it’s very apparent that the frequency of top-ranking scores for “Benin/Togo” and “Cameroon, Congo, Southern Bantu” among African Americans is clearly inflated now (i’ve actually not seen anyone yet with a primary score for any other African region!). This rather generic outcome is obviously not in line with historical plausibility (generally speaking & leaving aside individual variation) as we know that AA’s have more diverse African lineage from all over West & Central & Southeast Africa! Also from the start I have pointed out that the “Cameroon/Congo” region is poorly designed as it covers ancestral connections to both the Bight of Biafra and Central Africa. 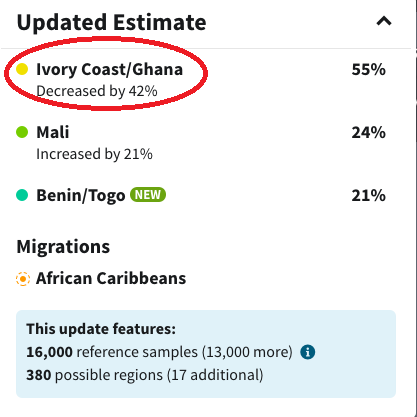 Instead of addressing these core issues or atleast attempting to achieve some improvement Ancestry has only made things worse with this update…It’s really frustrating as I feel all of this could have been prevented if only Ancestry had designed its updated African breakdown in a more thoughtful manner.. The more I’ve been on here and been studying this, it seems “Benin/Togo” is a fairly decent region for nailing down Ewe ancestry, but little else. I’m thinking, then, that maybe the Fon-speakers of Gbe should be folded into “Nigeria.” Because while they Ewe and Fon are both Gbe languages, it seems that the Ewe are genetically more distinctive (maybe even less mixed) than the Fon, who have lived very close to and mixed with the neighboring Yoruba quite a bit. The second largest group in all of Benin, in fact, are the Yoruba. Seems to me that there maybe needs to be a “Ewe” category that cover this distinctive group in Togo and far-southeastern Ghana and fold the Fon into “Nigeria.” Further west, they need to pare back down Mali, and then need to pare down even further “Ivory Coast/Ghana” so that it doesn’t pick up so many samples to the west (Liberia, Sierra Leone, etc). Again, this all seems so obvious and simple to me, I don’t know why it doesn’t to them. I have not seen actual Beninese results yet which have been updated. However I do know that the number of samples being used for the “Benin/Togo” region has been increased to 224. It used to be 60 so that ‘s quite a considerable increase! I have a feeling not all of these samples have been recruited among Gbe speaking people such as the Ewe and the Fon but also among other ethnic groups. And this might then possibly provide a (partial) explanation why this region has become so ridiculously expansive. More details in parts 2! While the micro-group numbers for Cape Verdeans might have been thrown off, would you say that that the decrease in West-Central and Southeast ancestry was an improvement for the macro-groups? I’ve been very vocal about it since this was first proposed, but I am beyond disappointed with the new “Benin/Togo” region, and I know for us in the disapora, it greatly reduces accuracy. And what’s worse is that not only is it worst for those of in the diaspora, but of the peoples of Benin and Togo, too. And then what’s worse is that according to your findings it’s less predicactive of Ewe origin, which was kind of the only thing it was useful for even before the update. So really, what’s the point, then? If they are even going to have this region, they need to do what some other testers do and simply relabel it “Broadly West African,” because that’s really all it’s measuring. Honestly, it should have never been labeled “Benin/Togo” to begin with, maybe “Ewe” and neighboring peoples or something, but you couldn’t even call it that, now. I think my opinion slightly differs on the combination of Cameroon/Congo and Southeastern Bantu. Had they only combined the region and nothing else, it would have been completely undesirable. While mislabeled “East Africa,” I think this addition makes the combination of the other two not as bad as it could have been. I’d have maybe named it “East African Bantu” or something, but I think still think this new region is better/more informative than the old stand-alone Southeast Bantu given what we know about Bantu migrations into southern Africa coming from the northeast (after having crossed the continent from West-Central Africa). Did I read this correctly? There is now an actual distinction between Yoruba and Igbo based on the amount of “Cameroon, Congo and Southern Bantu” a Nigerian has? There wasn’t a correlation before even though most of us thought there was one. So is it true now that it’s easier to distinguish between invidiuals from Yorubaland and Igboland based on Cameroon, Congo etc. overlap with Nigerian and Benin/Togo? BTW, for South-Central Hunter-Gathers, while the map shows it’s centered on Tanzania, this may be in error. I can imagine that it might actually be measuring the Twa and Mbuti pygmies of the Great Lakes which are also in this region and who probably came from the west. I’ll probably have more questions and observations later since this was so comprehensive. But that is it for now. I’m inclined to say yes, although really I have no independent way of verifying (aside from DNA matches which I will explore in an upcoming blog post). When I first started out with my survey I was quite surprised to see Cape Verdeans scoring other African regions besides “Senegal” and “Mali” (as well as “Africa North” but that’s probably mostly Portuguese derived). As I was under the assumption Cape Verdeans were completely Upper Guinean on their African side. This assumption being based on my reading of many historical sources (incl. primary ones) dealing with Cape Verde’s African origins (see this website for more details). Because these unexpected Lower Guinean and Central/Southeast African regions were usually showing up as trace region I figured it was just a misreading on Ancestry’s part. However later on I got to see more substantial scores, above 10% even, for regions such as “Nigeria” or “Southeaster Bantu”. From what i’ve seen all of these scores are now either heavily reduced or gone. Not completely sure what happened but i think it’s a combination of the new algorithm which is known to be extra tough with trace regions. Plus also the great increase of Malian samples which causes Cape Verdean DNA to gravitate mostly towards to that region now. “Southeastern Bantu” was far from a perfectly designed region because it was (most likely) based on very diverse Bantu samples from not only Kenya and South Africa but also Namibia. Those last ones being southwestern Bantu rather than southeastern Bantu. And they may probably have caused the greatest pull for Angolan-like DNA among Afro-Diasporans (in particular Brazilians and Mexicans for whom this region was often primary in their African breakdown). I have only seen one updated Angolan result yet, so I’m not completely sure but sofar this new “Eastern Africa” region seems to be strictly on the east side. So I agree that’s a good thing. My issue is indeed the labeling as well as the overextended regional span. In my experience many people tend to associate “East Africa” more so with Northeast Africa rather than with Southeast Africa. Eastern Africa is of course an enormous area but for genetic purposes I find personally that there’s more added value in distinguishing between Southeast Africa and Northeast Africa. In this way genetic affinity with Bantu-speaking populations can be separated from genetic affinity with Nilotic/Cushitic speaking populations. However most DNA testing companies tend to be a bit sloppy in this regard, not only in the labeling but also in their selection of East African reference populations. This causes a lot of unnecessary confusion. This was already the case for the “Southeastern Bantu” region when reported for Northeast Africans. And now again it seems poised to cause confusion on exactly which kind of East African lineage is being suggested by this region. Renaming it in “East African Bantu” or better yet “Southeast Bantu” might indeed help things for Afro-Diasporans as this would be the most plausible scenario for them, generally speaking. However for Africans themselves it may again contradict actual Nilotic(-like) background for Northeast Africans. While for Southern Africans it would probably be a bit misleading of actual migration flows because “Cameroon, Congo and South Bantu” is most likely also incorporating Bantu migration which came down taking an eastern route (Uganda/Tanzania/Mozambique) and not just directly by way of the Congo into Zambia/Zimbabwe/Malawi. Very interestingly on 23andme, which already used to have a very solid East African category based on Northeast African samples, they have now created several new and very specific East African categories. Including “Sudan”, “Somali”, “Ethiopian & Eritrean” and “Broadly Northeast African”, “Southeast African” and “Broadly Southeast African”. I have already seen quite a few very impressive results for Eritreans. I intend to blog about 23andme’s update eventually. The difference in group averages has become greater indeed. Then again my sample size for this before & after analysis is rather limited. It’s true though that for the 6 Igbo individuals in this before & after survey i found a group average of around 30% ” Cameroon, Congo, S. Bantu”. Likewise for the 9 Yoruba individuals I included in this blog post I found a group average of about 10% “Cameroon, Congo, S. Bantu” But for one of them it was actually 27%! So there is some individual variation and only greater sample size will give more certainty of the patterns. Based just on the previous version I do have a greater sample size for Nigerian results btw. (n=77) And I intend to blog about it eventually because despite overlap and other shortcomings I do think it already was quite insightful to understand some of the population structure in Nigeria along ethnic lines. Perhaps, would be a major error though, lol! I do think additional Tanzanian samples make sense when wanting to explain how Northeast Africans are suddenly given primary “Hunter-Gatherer” scores. Also Ancestry did change not only the map but also the “also found in” details, which now include countries as far north as Djibouti (!) and South Sudan. But who knows? Ancestry has already been kind of sloppy with the regional description texts which seem to have remained the same. Any new Tanzanian samples are indeed not mentioned but perhaps the text is still under revision. Also intriguingly the total number of Hunter-Gatherer samples within Ancestry’s Reference Panel seems to have remained practically the same (35/34)! I will try to get more details in the second part of this blogseries. Thanks for the reply. Yes, I see that “East Africa” seems to have different connotations based on what culture one is from and even within cultures what it means can differ. My frame of view is that Niolitc and Cushic peoples are a “seperate” group and sub-region, and that “East Africa” is based in the Bantu-majority Kenya and Great Lakes area. I can see how other’s would group and organize it differently, though; I’d bet most people would include Ethiopia, Sudan and Somali in this region. It’s just that in my mind, I see the Kikuyu and Luhya when I hear “East Africa.” Maybe the region needs another name, and more likely, the area needs to be split up into seperate regions, as Nioltic and Cushic people as a group are genetically distinctive from even each other, and certainly from Bantu peoples. Like you said, though, you have already found out which samples they have used for “East Africa,” so you have more insight and thus a different frame from which to look at this than I do. I fully look forward to your second post because, yes, if we know they are heavily weighted towards one group than the other, we’ll view the regions differently. I am interested to see if it’s a healthy mix of Bantu, Nilotic and Cushic, or if it’s heavily weighted to some more than the others. Where can I send my old and new results and the decrease/increase page? Sorry but I’m no longer continuing my survey. It sad you don’t continue your survey, it was very helpful. Since I found your website in 2015, I read many books and articles about African origins of the diaspora in the Americas and I liked to make a bond with your results, even if you have a tiny sample. You were very accurate. Thanks a lot for your comment Geoffrey, much appreciated! Thank you so much for all the hard-work Fonte. Your blog was so insightful and it was a pleasure following you. Hopefully AncestryDNA realizes soon that they have been disappointing Afro-Descent customers with their latest updates. As for me personally, I would no longer recommend them to other Africans and Afro-Diasporans until they improve their African breakdowns and estimates. If one’s interest is in finding a wide variety of matches, you can’t really beat them. And, if you’re from the U.S. and trying to build a family tree, they have a ridiculous amount of records. But as for the admixture part of this? There is no way in good conscience I could recommend them for that for people of predominantly African descent. All anyone in the disapora is going to “discover” from their admixture estimates is that their ancestry is either broadly West African (“Benin/Togo”) and/or Central & South African (“Cameroon, Congo & Southern Bantu”). Like, whom among us doesn’t already know that? That’s how much they’ve flattened out their “regions.” And as for Africans living on the continent, this is even more insulting, quite frankly. I don’t know if I’m ever going to get over this update. lol It seems so incredibly ill-advised that you have to wonder if they were TRYING to offend. Because who could have tested these new regions and then said “Yeah, let’s put that out there for public consumption,” and thought it was a good idea? In an organizatio or business with real controls, this update would have never made it out of the testing phase; they’ve have rightfully gone back to the table and started over from scratch. Me neither! I don’t think that I am going to get over this nonsense, I am so upset it is not even funny. I feel like they focused on improving estimates for their predominantly Euro-descent client base and neglected us (their Afro-descent client base) maybe because the Euro clients outnumber us and hence represent their biggest share of revenues? I am maybe wrong, I don’t know, but I don’t understand how they let us down like that. I find no other reason though, because that argument they provided on their FAQ section about Africa’s diversity does not make sense….the diversity should be a reason to further breakdown their African regions…anyways, like you said it is insulting. We also paid for the services so we also have the right to request them to put as much effort as they did for Europe to improve our regional breakdowns and estimated %. I think it’s even worse than that. It’s not that they just paid more attention to European backgrounds than Africans, but someone ACTIELY ended up making the African results worse than before. 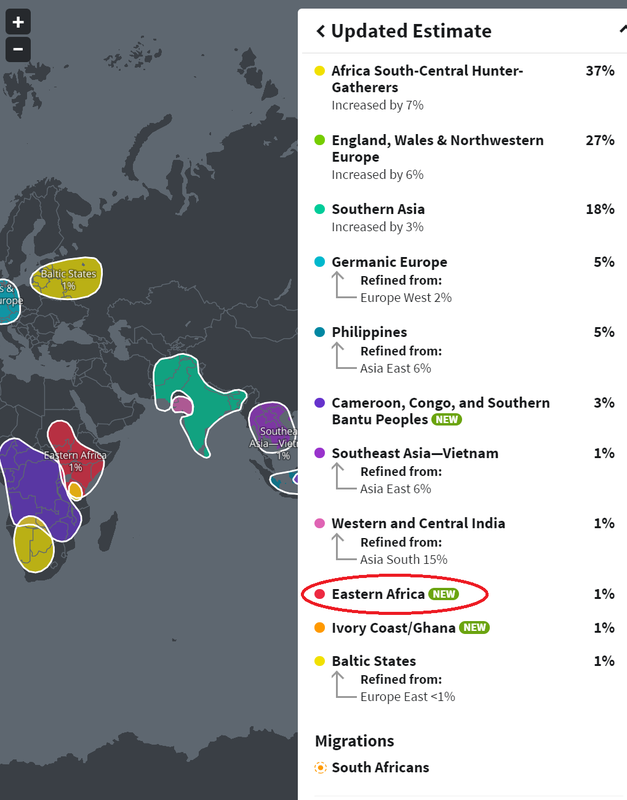 I’d have been less angry had they simply tweaked the African regions while making European results far more accurate – and, to be sure, my significant European ancestry was made FAR more accurate than it’d been before. The problem is that it almost seems like they TRIED to make the African DNA more broad; there is really no other explanation when so many of the regions are literally expanded. I emailed them and asked a representative over the phone if they could please if nothing else add the publicly available African populations on ” international genome” to at least let us have something. I believe that Myheritage has used them and if they able to use them, then ancestry.com should have been able to use them too. 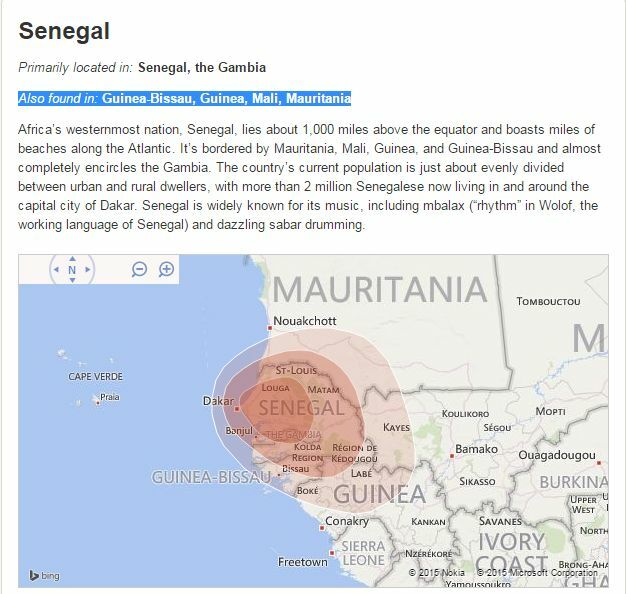 http://www.internationalgenome.org/data-portal/population There’s multiple Gambian populations (Mandinka, which is already used on “Senegal” but still adding more to the 20 or so Mandenka wouldn’t have hurt. They also have Jola, Wolof and Fula) along with Esan of Nigeria (in addition to the Yoruba), and Mende of Sierra Leone which should really be an important reference for African Americans since so many victims of the Transatlantic Trade who were brought to the U.S. were indeed Mende and Temne of Sierra Leone because of their ability to work the rice plantations of South Carolina. The answer I got from ancestry.com was “we’ll look into it.” Of course we now see they didn’t even bother to do so. Ridiculous. After further review of my results and plugging the raw DNA Into Gedmatch, they definitely don’t make sense…to a degree. My Nigerian Fulani results for myself and my mother are still very prevalent as well as Fang, Bamoun, Igbo and Hausa. For me to jump from 7% Malian to now 18% is questionable as well as my North African 3% decreasing to 1%! In fact, my mother can trace her lineage to pre-1860 Virginia where a high Nigerian (Igbo) presence has been documented but now Ancestry says my mother has absolutely NO NIGERIAN DNA where before she was 25%. Also through Gedmatch, I was able to find a 5th generation cousin of mine who is IGBO. So what in the hell? Could you possibly give us your opinion on African Ancestry’s DNA test? I’ve heard/read/viewed mixed reactions to their testing as most have said that it is impossible to link African Americans and those in the diaspora to one specific ethnic group. Look forward to hearing from you! I have no personal experience with AfricanAncestry. As I have already tested with 23andme (which is cheaper and offers additional reports) I already know my maternal haplogroup, so I do not think there is any added value in testing with AfricanAncestry as well for myself. They do claim to be able to pinpoint specific ethnic groups you share either your direct maternal or paternal lineage with. However this does NOT exclude the possibility that you might not in addition also share your direct maternal/paternal lineage with other ethnic groups. So in that sense I find their advertisements and the certificates they give you a bit misleading. Plus of course your direct maternal/paternal lineages are only a very small part of your complete ancestry, perhaps around 1%. Which leaves 99% of your origins still uncovered after having paid a quite high price! Excellent and educative exposé! You were very thorough. Thanks for your efforts. In other news, I do miss my trace regions. Thank you for the appreciation! You’re not the only one to miss their former trace regions. From what i’ve been reading it’s a very common reaction. Trace region reporting has indeed become more conservative, probably mostly due to their new algorithm. And that might be an improvement in some aspects as trace regions often seemed to be based on a misreading of very ancient genetic similarity. However in other cases I did find that trace regions could be validated by DNA matches. That is a quote from their previous white paper. In part 2 of this blogseries I will discuss some intriguing aspects being mentioned in their new white paper. Thank you for this insightful assessment. As a Liberian, my scores seem off; at most the Benin/Togo aspect. My Mali was at 6% but increased to a whopping 36%. My Ivory-Coast/Ghana scores decreased significantly from 89% to 50%. Ok, maybe I could work with that considering our history and previous DNA analysis. Understandable that my father was from the KRU tribe which borders Ivory-Coast/Ghana. However, my South-Central Hunter-Gathers scores that most Liberians carry (interception of a slave ship from the Congo into Liberia), has been replaced with Benin/Togo at 14%. I highly doubt that based on our history and the distance between countries alone. Very disappointed in AncestryDNA test to say the least. Thanks for your comment Georgia. I also find it unbearable how Ancestry has undone their analysis of Liberian DNA! Despite the lack of clarifying labeling i found that the socalled “Ivory Coast/Ghana” region was very useful for describing Kru lineage especially (aside from also Akan lineage). Some of the highest “Ivory Coast/Ghana” scores in my survey based on the previous version were coming from Kru persons. Thank you for this post. For people in the diaspora, I can now guess what their top three African regions will be (Cameroon/Congo, Benin/Togo as #1 and #2 in whatever order, then Mali). It’s like they’ve made everyone clones now. Unfortunately, I don’t see anyone noticing this or caring besides people of African descent. The updated African results makes it seem even more obvious that this update wasn’t beneficial for those with African ancestry. It literally confirms that they messed up. An Ivorian going from 97% Ivory Coast/Ghana to 55%. Really? lol And that’s just one example. Nice that they made ancestry more accurate for Europeans and Asians, but they really dropped the ball on African results. I see a lot of Americans with European ancestry saying the update matches with their paper trails, which is great. But we have ancestryDNA messing up on people who were literally born in Africa, not relying on a “paper trail” at all. 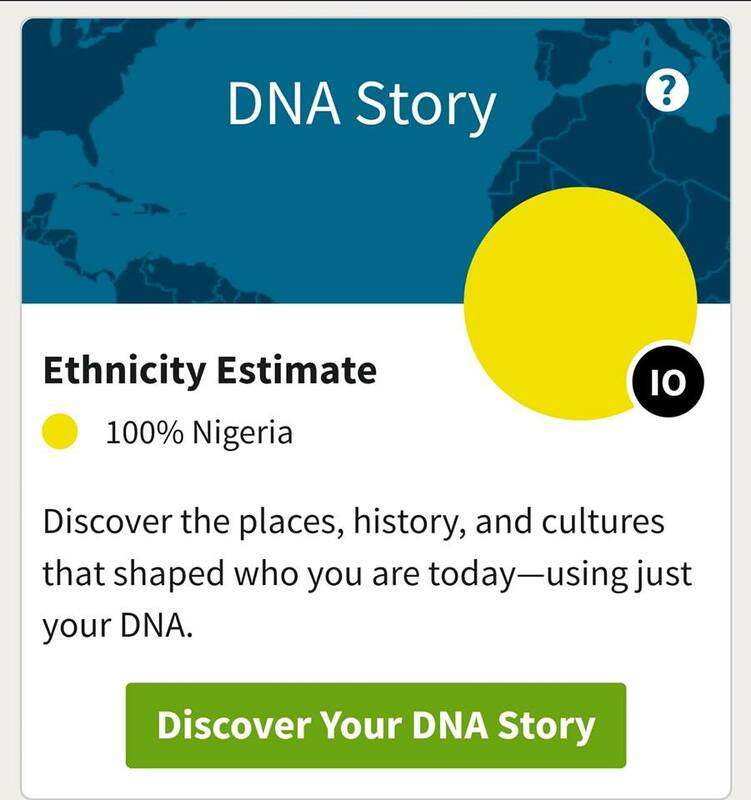 I recommended ancestryDNA to other people since they had gotten my ancestry correct (and I saw that many Africans had results that made sense), but my results are really off now so I probably won’t be recommending it to other people of African descent any more. “Due to historical circumstance Afro-Diasporans are arguably in most pressing need of receiving finer regional resolution of their admixture results (aside from adoptees). Most people in the Afro-Diaspora do not have any detailed knowledge about their African roots and are usually very eager to learn more. Not anything with “100% accuracy” even but just something meaningful and relevant which goes beyond the lump category of “West African”. they really screwed up, is it laziness? Hey James, I had to edit your remark as I cannot allow offensive language in the comment section. But I agree it’s interesting to think about what caused Ancestry to downgrade their African breakdown? Some other people have already commented on this. I like to add that Africans and Afro-descendants do indeed not make up a large demographic within Ancestry’s customerbase. And as a profit-driven company it’s probably natural they will prioritize the needs of their most numerous customers, who happen to be mostly of (northwestern) European descent. Still from what I’ve seen improvements have been achieved also for people of various other background, incl. also Hispanics, Middle Easterners and Asians. So why not build further on the pioneering advances they made in 2013 for African DNA as well? One thing that has crossed my mind is that perhaps the team of researchers Ancestry had in place in 2013 (see this article) is no longer working for them, or at least not all of them. Their replacement perhaps having different specializations/focus/ability than previously, making them unfit to follow in their footsteps? What I find very ironic is that DNA testing has apparently really taken off in the last two years (see this article) . Because I have been doing my AncestyDNA survey already since 2013 I have been able to keep track of this increasing popularity myself as well. As I was always on the look out for adding new results (lol) I tended to keep a close eye on various social media. And one of the things that struck me is that it was often African Americans or other Afro-descendants who seemed to create the most buzz. Especially in the early days on Instagram, Twitter etc. and also with the first socalled reveal videos on Youtube, which were quickly copied by other people. I wouldn’t be surprised if commercially speaking this highly visible “early adopter” behaviour by Afro-descendants may have made a disproportional but clearly beneficial impact on the sales of Ancestry and other DNA testing companies. This also harks back to what I mentioned earlier about DNA testing for Afro-Diasporans presenting a special and more pressing case because of slavery and the slave trade history. This issue is widely known because of popular TV shows like Finding Your Roots with Henry Louis Gates Jr., which started in 2012. But which actually was preceded by a similar show called African American lives, in which the African roots of celebrities like Oprah Winfrey were being revealed. And also of course the immensely influential ROOTS miniseries from the 70’s which was aired again in 2016. Is it a coincidence that these developments in popular culture, spearheaded by African Americans all took place right before DNA testing took off, which lead to Ancestry right now having a customer database of 10 million??? Obviously also other factors are to be taken into account. Ever increasing globalization has caused a feeling of rootlessness for many people across the world, irrespective of background. And it has also lead to a refocus on core identity. Which may have helped in triggering an interest for DNA testing even among people who are already aware of their immediate background. Then again African American influence on global media & popular culture is also not be underestimated. I would definitely like to see more research being done on what exactly caused the popularity of DNA testing to increase the last two years or so. A customer database of 10 million??? Jeezz! :0 with registering fees being between $60-$100, this is a lot of money! lol But as a side note, although continental Africans probably represent the lowest share of their customer database, 10 million people is a lot, and I am sure there is a sizable number of African customers among them, so they could have exploit this opportunity to considerably increase the number of samples in their reference panel for each african regions (I have seen that they increased Mali from 16 to 169 samples, but still… ) and further the breakdown, but I guess Africa was the least of their priority. Yeah it’s big business alright! Makes you wonder what they’re doing with all those profits lol. I agree that Ancestry should make more use of the African customers it already has in their customer database. One of my suggestions for improvement actually said the same thing! From what i’ve seen their numbers could easily be several hundreds, probably over a thousand already and perhaps even a few thousands. Some countries being over-represented but still already covering practically all of the continent. Does anyone know a contact at AncestryDNA at which to complain about this update? I have added a few other updated African results in the screenshot section: 1 from Guinea Conakry, 1 from Tunisia, and two from Benin. Especially the ones from Benin might be significant. Similar to my 3 Ewe samples from Ghana also for these two actual Beninese samples with Gbe background (Ayizo & Goun) the “Benin/Togo” amounts did not change much. Although interestingly for one of them it decreased by 9%. The “Ivory Coast/Ghana” amounts making the biggest increase (10% on average). The sample-size might be small but it is perhaps telling that no 100% “Benin/Togo” scores were achieved (like for updated Central African results). Fonte, which groups did you add the Guinea and Tunisia samples? I imagine the Tunisia invidiual was grouped into Africa North, but what about the Guinea Conarky individual? In my online spreadsheet it’s between other results from Upper Guinea. I have not yet updated the screenshot (table 1) though. It’s interesting because this Mandinka individual shows the highest updated “Mali” score (79%) I have seen sofar. Even more so than a Soninke person from Mali who now has 70%. Both of these persons however had “Senegal” in first place before the update. 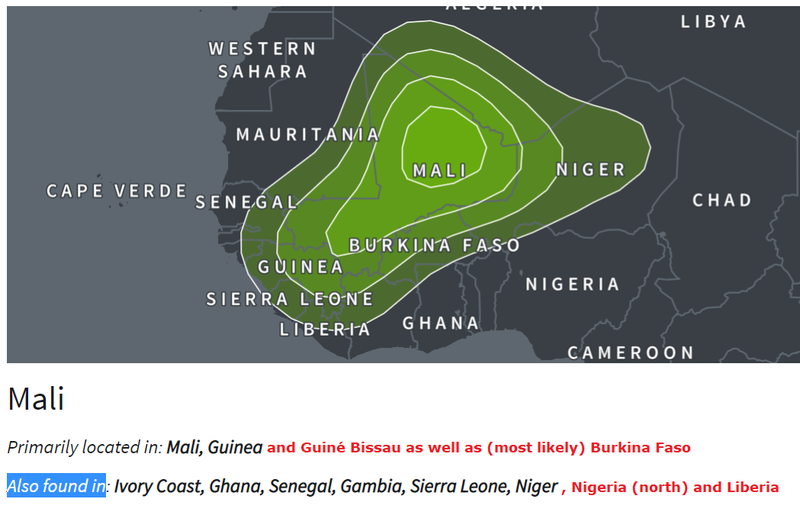 Ancestry has always said that their “Mali” region peaks among actual Malians as well as Guineans. So this much still seems to hold up. Oh, okay. I thought you re-posted the screenshot to show you’d updated it. So the Guinea individula is a Mandinke, eh? Maybe that’s a clue about what “Mali” is measuring. If it’s weighed towards Mande peoples, it might be likely that it’s picking up a lot of groups in Guinea, Sierra Leone, Liberia…this may account for the downward pressure we see on the “Ivory Coast/Ghana” region and the significant increase in the “Mali” region we’re seeing. Perhaps so. But Mande speaking groups are likely to show a significant degree of genetic variation amongst themselves though. Although never confirmed by Ancestry I’m pretty sure for example that Senegambian Mandenka samples (from the HGDP database) have been used for the “Senegal” region. But probably because of their location and particular history they will have intermingled with surrounding Atlantic speakers across the centuries. Whereas in the Mande heartland: (southwestern) Mali and eastern Guinea probably this component is less prevalent. In the southern extensions of Mande speakers (Liberia, Sierra Leone) quite likely also intermingling with Kru-speakers may have taken place. The Mende for example being known to have migrated by way of Liberia and also assimilating many local people. I just posted the second part btw where I also discuss the possible ethnic backgrounds of the new Malian samples. My mother and brother have a Malian match who actually scored 88% Mali with the new updates. His results are 88% Mali, 8%IVC/GH and 3% Benin/TG. Nice! Do you have any idea about his ethnic background? Just the other month I blogged about this survey I’ve been performing among 50 Cape Verdeans and their African DNA matches on Ancestry. As expected most of these matches (227) are from the wider Upper Guinea area. But despite the current inflated “Mali” scores for Cape Verdeans I only managed to find 1 confirmed Malian match (Bambara), haha. Most matches were actually Fula but for Senegal for example I managed to find at least 35 matches (Wolof, Diola, Sereer etc.). Recent Malian and Ivorian immigration to the United States has been very, very small. Even still, there are over twice as many Americans who’ve identified as Malian (5,000) than Ivorian (15,000). Though, these are very rough estimates and only include Malian-born immigrants and not necessarily their children, and obviously not illegal immigrants or which there seems to be a signifiicant amount. Large-scale Malian immigration to the States didn’t begin until the 1990’s; Ivorian immigration began a decade earlier. I was surprised to learn that most Ivorian immigrants come from the Mande (Dioula dialect of Bambara) and Gur-speaking portions of the Ivory Coast, so they’d likely differ only slightly with Malian Americans. Hey Fontefelipe I wanted to get back to you sometime on my testers “updated” ethnicity results a few weeks ago. The tester whose updated results I shared on “1 July 2018 at 12:40” was my maternal grandmother. My other two testers are my maternal grandfather and father. my grandma’s “updated” results haven’t changed (just like I thought they wouldn’t). This job by ancestry.com is definitely still a disappointment. I had to look over my dad and maternal grandparents while going over what covered. 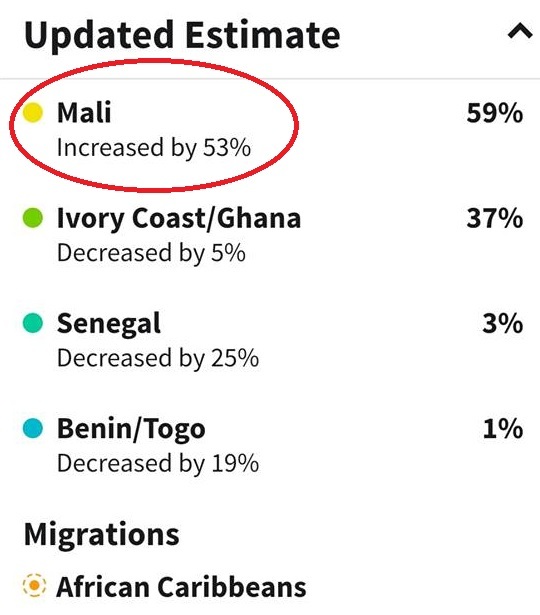 My dad previously had “12% Senegal” and a “low confidence region 3%” for “Mali” Now “Mali” has increased to “10%” and “Senegal” ,just like with my granddad, is also “no longer in estimate” Wow. (even though I had my dad and grandparents do ancestry.com DNA the next year, I was following the news about ancestry.com’s test since before they released it in May 2012, even back in February 2012 with that episode of “Who Do You Think You Are?” with actor Blair Underwood) to September 2018 for an ethnicity update, there is no telling just how much longer into the future we’ll have to wait until ancestry.com corrects this mistake or even if any company comes out with worthwhile African breakdown. Hey Anthony, this is exactly my concern as well! How long will it take for Ancestry to correct this downgrade? They do mention they are aware of the problem and seeking to add more African samples. Perhaps starting up something similar as the African Ancestry Project on 23andme. However that project also took five years to complete…. In the last part of this blogseries i will discuss this some more. I’m so glad I found your article! I see I’m not the only one confused and/or disappointed by the recent update. 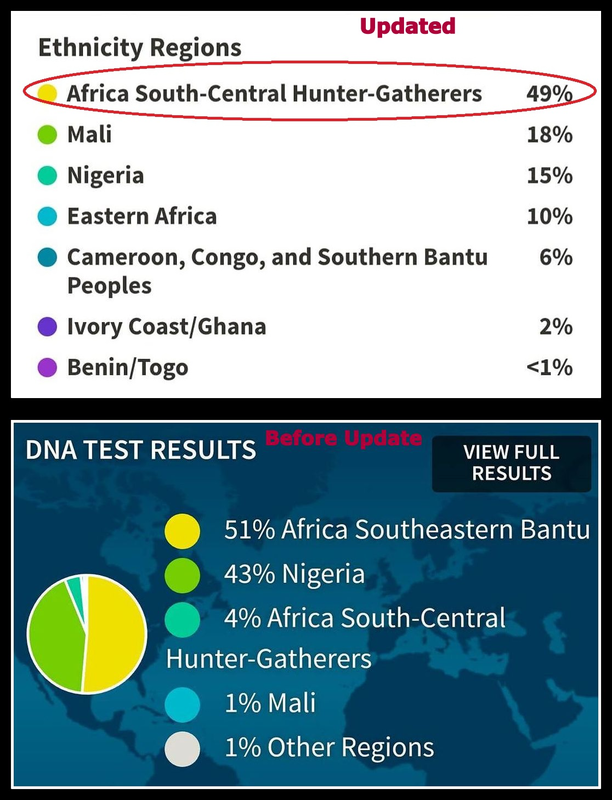 I’m African American and my original results showed 44% Mali, 13% Nigeria, 13% Cameroon/Congo, 2% Africa North, 1% Ivory Coast/Ghana, 1% Africa South-Central Hunter-Gatherers, <1% Africa Southeastern Bantu, and <1% Benin/Togo as far as African ancestry. My updated estimate showed 37% Cameroon, Congo & Southern Bantu Peoples (Increased by 24%), 19% Benin/Togo (Increased by 19%), 11% Mali (decreased by 33%), Ivory Coast/Ghana (Increased by 7%), and Nigeria (Decreased by 12%). Africa North, Africa Southern Bantu, and Africa South-Central Hunter-Gatherers were removed from the estimate. I was shocked when the first results I received in July showed that I was almost half Malian and now I’m confused by the sudden change. It says on the site that they’re working on getting more samples but as you stated the last update decreased accuracy. Side note: What are your thoughts on AfricanAncestry.com DNA testing? I have no personal experience with African Ancestry. If you have already tested with 23andme (like I have) you already know your maternal haplogroup (for a much lower price!). And so I do not think there is any added value in testing with African Ancestry as well. Do you think I am mainly descended from Yoruba? Or maybe Igbo? Or Hausa-Fulani? Or if an intermix of them then which tribes do you think I may be descended from? I GREATLY appreciate your help with this and I love your informative website! 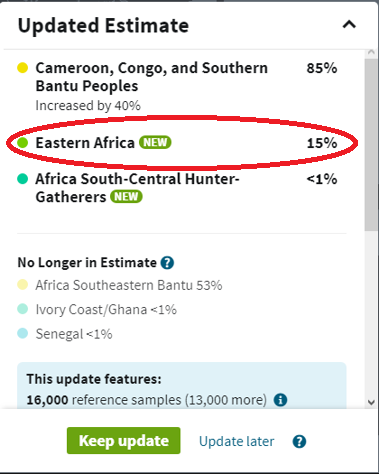 I check my Ancestry matches nearly daily as they update them, and have finally began to notice what I feel is another problem with them since the update. I’ve noticed that with my American matches who are overwhelmingly European ancestry, but who also have trace amounts of sub-Saharan African ancestry that the later is almost always given over to 1% or 3%; it’s very rarely ever over 5% and it’s almost never an even number. The likelihood of all of these matches havving exactly 1% doesn’t seem high to me. It’d seem to me that most would either have higher percentages (though still very small), or it would have been washed out entirely for most matches if it’s that far back. I realize the quirks of recombination and such, but what it seems to me is that they must be giving over unassigned DNA to far-flung regions for many Europeans. Just seems weird to me I don’t ever see 2% or 4% or 6%. I’m not sure I’m liking their low-single digit assignments of DNA. I think their “trace” regions were actually more helpful. It seems like most folks I see with single digit regions almost always have 1% of some region included. Do you have any idea of why or how 1% pops up in so many people’s regions? Is it likely it’s just them rounding up to 1%? For instance, I have 1% Spain. 8% Iberian in the last update, I suspect I have some unknown amount of dna from the peninsula, but it’d seem to me it’s awfully convenient everyone keeps getting 1% or something. Even in the old update they had a “less than 1%” measurement. Most of these are rhetorical questions, and I’ve kind of gone over some of these problems I have with Ancestry before. But don’t you also find it a bit strange/convenient? I’d rather them simply have an “unassigned” category if they aren’t confident that you have a region. That’s peculiar indeed! I have not been observing the updated results of white Americans with minor African DNA. But I might do a small survey of the admixture results of Portuguese DNA matches for my Cape Verdean survey participants. Some of whom also show minor African DNA, usually North African but at times also from other parts. The Bassa appear to have been a coastal Bakongo people, but who were driven inland by the influential and partially westernized Duala people in the late 17th and early 18th century. Because of this, many of them speak Duala, today. The Duala leant their name to what is now the largest city in the country. The Banen seem to be a much more obscure and marginalized group only numbering in the tens-of-thousands, but who are neighbors of the Bassa, though located a bit further inland. It appears that even more than the Bassa that they were anti-colonial peoples, which resulted in them being dispersed and their culture – most notably their language – much maligned. In any case, the Banen are so mixed with the Bassa, now, that they are often not even included as a seperate people. Anyway, I’m interested that I’ve found another Cameroon cousin. Oh, and I found another full African match who is from Ghana, but she’s yet to tell me what group she is from in the country. 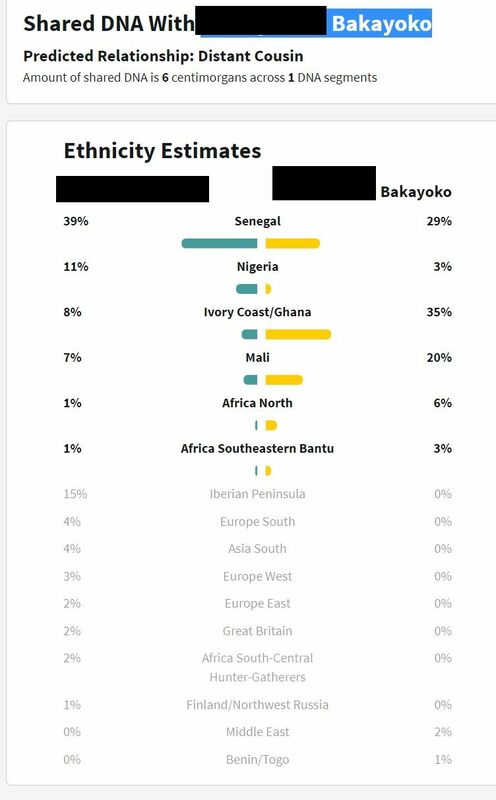 She scored 63% “Ivory Coast/Ghana” and 37% “Benin/Togo.” It will be of interest to be to see if she’s another Ghanaian Ewe cousin or maybe from the dominant Akan peoples. If she’s Ewe, that’d be my third Ewe match. Thanks for sharing! Which version do you prefer for describing your origins? Also what do you think about the 15% “Hunter-Gatherer” score? 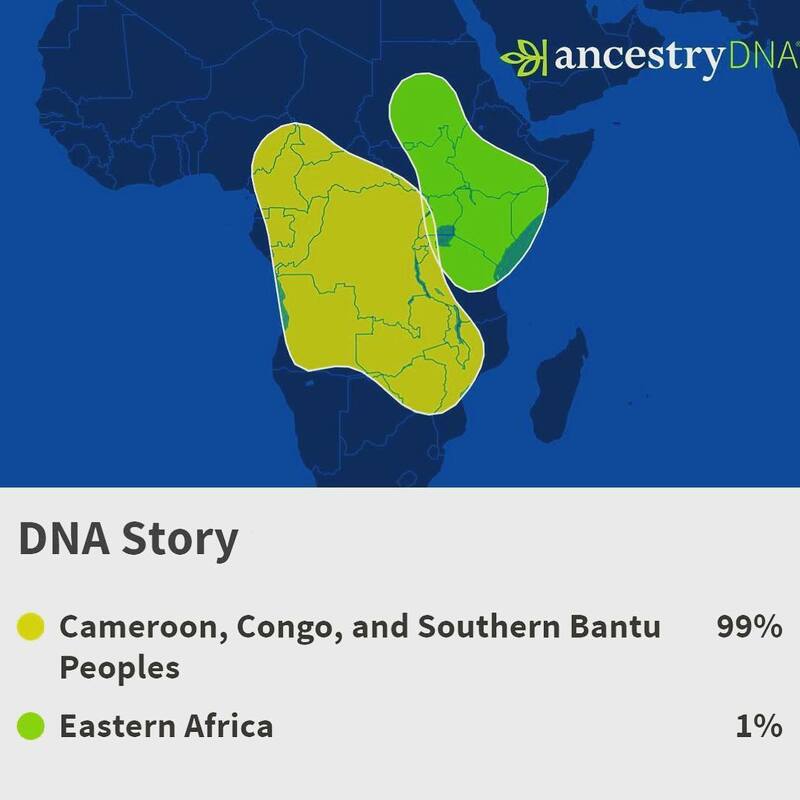 I see, 23andme has recently updated their African breakdown and it also mostly features modern country labels. I understand this will be more straightforward. But I’m guessing this will only work for genetically homogeneous countries. However given that Kenya is such an ethnically diverse country it seems inevitable that any “Kenya” region would be highly variable. On 23andme right now the default region for Kenyans is “South Eastern African”. But depending on actual ethnic background Kenyans might also get substantial scores for “Ethiopian & Eritrean”, “Sudanese” and “Congolese”. All modernday countries but still also confusing I imagine when taken too literally. You are right that both 23&me and ancestry don’t work very well for Kenyans hence why I chose to utilize gedmatch’s calculators. The Kalenjin are predominantly nilotic – perhaps similar in genetic makeup to the Maasai. Thank you! 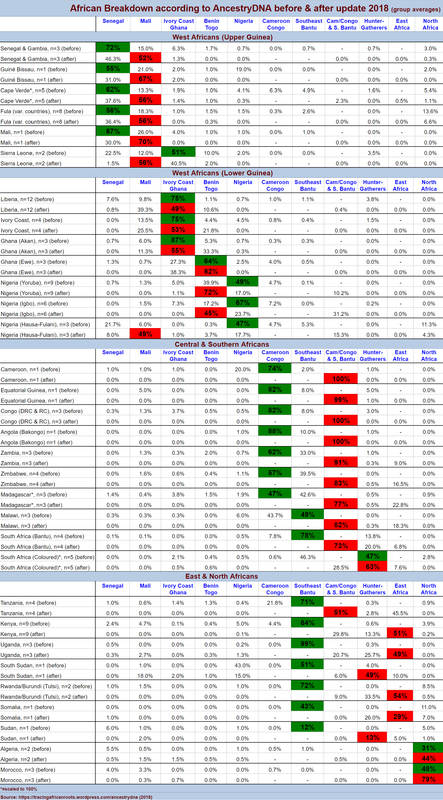 I actually tend to see more informational value in the pre-update results. As I stated in this post I have already discontinued my AncestryDNA survey. But it is still interesting to see updated results from Kenyans! Are these Kenyan matches reported as close matches (>20 cM)? The Luhya and Kalenjin are distantly related with less than 7cM shared DNA, but the Maasai is considered a fourth cousin with 25.5cM shared DNA. In your view is that significant?